The Ohio Department of Natural Resources (ODNR) released Q4 2013 production numbers yesterday for Ohio's Horizontal Utica / Point Pleasant Shale Wells. The report sheds some light on why drilling activity is where it is today and what should be the trend going forward. At the same time, most believe that we are still in the early days so things will evolve as more and more data helps to better define the best areas. 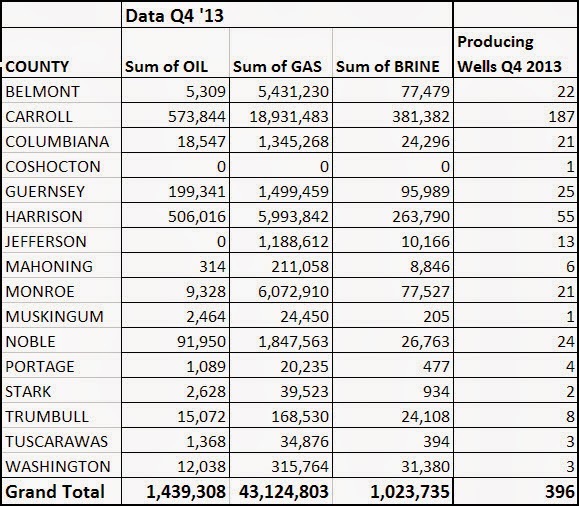 Looking at these numbers and assuming total days of production during the quarter was relatively the same, Harrison county is the big winner with it's typically higher valued oil production. While Carroll county has 240% more producing wells than Harrison county (187 vs. 55), Carrol county saw only 13% more oil production than Harrison county. At the same time, Harrison county looks to be just slight more prolific with respect to natural gas when compared with Carroll county. Carroll's 240% additional producing wells saw 215% more gas production. Monroe county looks to be the big winner with respect to natural gas production, producing far more gas per well than either Carroll or Harrison counties. As a comparison, Monroe natural gas production was just slightly above Harrison county, while Harrison county has 162% more producing wells than Monroe county. And detailed below, Belmont County is not far behind Monroe county in Natural Gas production per well, producing 5,431,230 MCF on 22 wells vs. Monroe's 5,993,842 on 21 wells. No wonder why the April 19th report shows Harrison county as the most active driller, with 36 wells drilling out of the total of 143 wells drilling, vs Carroll with 30 wells drilling, Monroe 23.Harrison county has also seen the most permits issued in 2014, so expect drilling and production numbers to follow. Production data summed by county below is below. 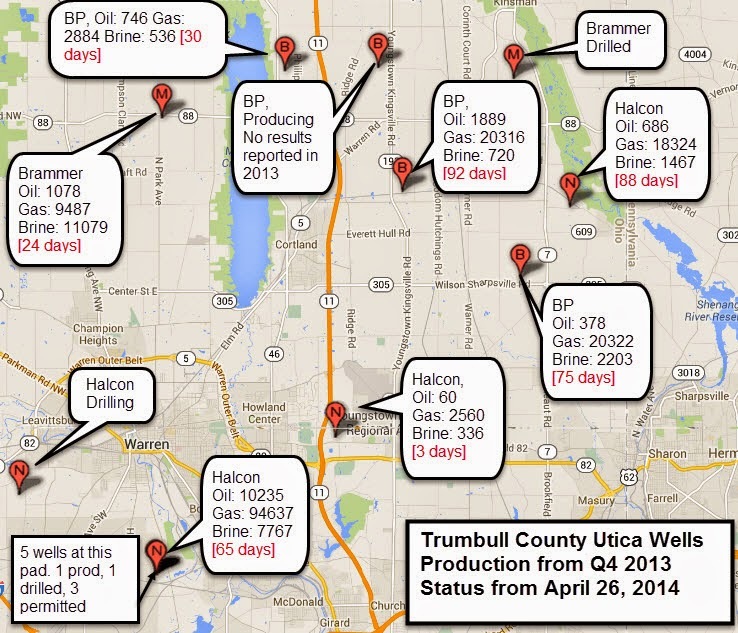 For a map of Q4 2013 producing wells including production data for each well (minus a few (11) as explained on the page), please visit the production map here. Note: Data is tabulated from the April 25, 2014 report provided by the ODNR. The April 12, 2014 release of Ohio Utica/Point Pleasant shale activity report showed twelve new permits issued for the week, dominated by XTO Energy with eight new permits, all in Belmont County. CNX Gas added three new permits, two in Monroe County and one in Noble County. Statoil came in with one new permit in Monroe county. A map of the newly permitted wells is found below. The same report also showed a total of 141 wells drilling, up eight from the prior week. Belmont county again showed up as the biggest gainer in wells drilling, with thirteen wells drilling, up from just six in the prior week. A map of all wells classified as drilling is found below. 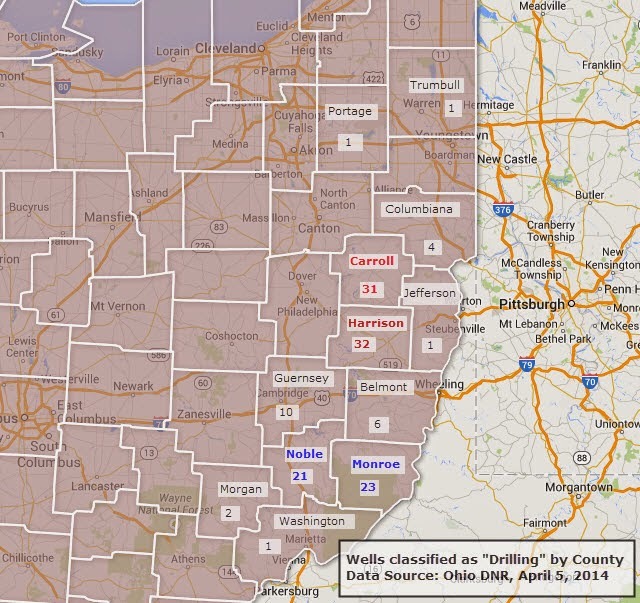 List summary of wells classified as "Drilling"
According to the Ohio DNR Utica Shale activity report released today, the number of Utica Shale wells classified as drilling is up 31.7% from March 1st, up to 133 vs. 101. 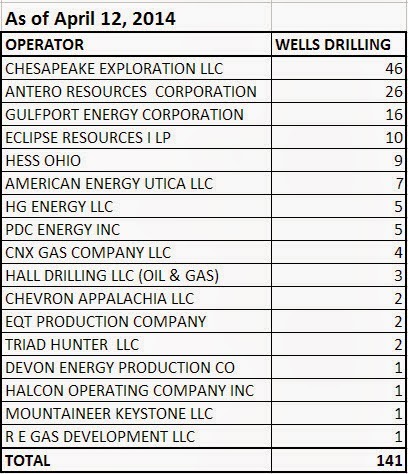 Chesapeake accounts for the bulk of the increase with 48 wells classified as drilling compared to 26 on March 1st.